UberNES Nintendo Screen Saver Lets You Watch NES Games Or Play NES Games | OhGizmo! By Andrew Liszewski on 10/06/09 • Leave a comment! I can’t remember the last time I actually used a screensaver, but that’s about to change now that I can spend my time starting at, and even playing, classic NES titles. 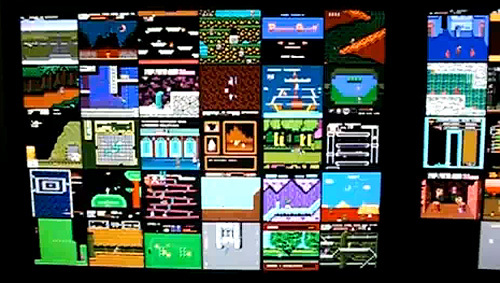 The Nintendo Screen Saver, from the chaps who created the UberNES emulator, lets you fill your display with a wall of NES titles running in their ‘demo modes’ but at any point you can hit the space bar and take over playing any one of the games currently on screen. Now since being able to play the games requires you to have the actual ROMs on your system, the legality of the Nintendo Screensaver is kind of a gray area, so if you’d prefer to stay legit, the screensaver can also stream pre-captured ‘movies’ of your favorite games from the UberNES gallery. Not as fun, but probably slightly safer if you intend to run it at work.